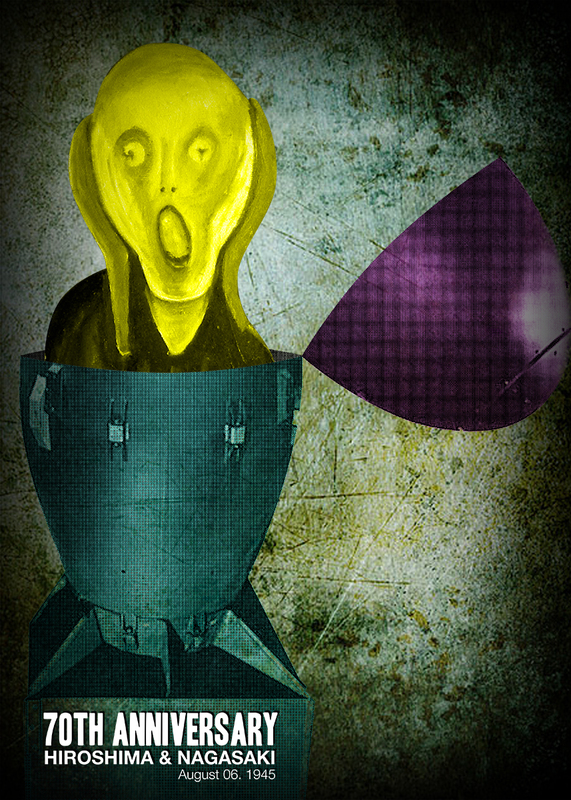 Posted in UncategorizedTagged atomic bomb, ecuador poster, fear bomb, hiroshima, nagasaki, no war, nuclear bomb, peace, poster, Santiago GómezBookmark the permalink. July 21, 1945: Secretary of War met several top U.S. generals in Germany. Gen. Dwight D. Eisenhower would years later in Newsweek write: “Secretary of War Stimson, visiting my headquarters in Germany, informed me that our government was preparing to drop an atomic bomb on Japan. I was one of those who felt that there were a number of cogent reasons to question the wisdom of such an act. …the Secretary, upon giving me the news of the successful bomb test in New Mexico, and of the plan for using it, asked for my reaction, apparently expecting a vigorous assent. During his recitation of the relevant facts, I had been conscious of a feeling of depression and so I voiced to him my grave misgivings, first on the basis of my belief that Japan was already defeated and that dropping the bomb was completely unnecessary, and secondly because I thought that our country should avoid shocking world opinion by the use of a weapon whose employment was, I thought, no longer mandatory as a measure to save American lives.